(Newser) – Activists for victims of a deadly London high-rise fire have taken inspiration from an Oscar-nominated film to press for more action by police. 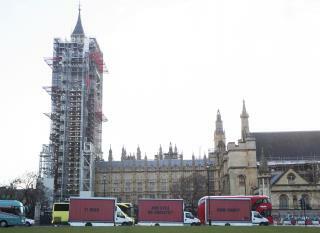 Three mobile billboards were driven through the British capital Thursday on behalf of the Justice 4 Grenfell campaign, the AP reports. The group was set up after fire ravaged the Grenfell Tower apartment block in June, killing 71 people.The signs read: "71 dead. And still no arrests? How come?" we know why! it's the same in America too, members of the Parliament have money dealings in it and don't want to push out the envelope that comes to them with money in it! Good for them, cause I had already forgotten about it. On the flip side I remember that many buildings in america were built in the same manner using the same materiels - we'll have our own one day.